In the late 1950’s, my Dad (Bruce) got a job working on merchant ships. Once of the first ships he worked on was the “Federal Pioneer” which was operating out of Montreal at the time. She was built in Montreal in 1944 by United Shipyards Ltd, was owned by the Canadian Governments’s Park Steamship Company. She was originally named “Outremont Park” and was chartered to the Ministry of War Transport for about 12 months. 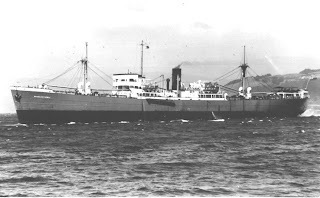 After the war, Furness Canada Ltd bought her and renamed her “Brazillian Prince”. In 1954 she was transferred to Furness (Montreal) Ltd and renamed “Federal Pioneer” in 1958. She was eventually broken up in China in 1971.